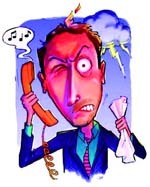 I have encountered poor customer service before – I’m sure we all have. But have you ever seen a company willing to record such a shocking attitude towards their customer in writing? 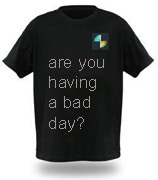 My experience when ordering a printed T Shirt online last week surely takes the biscuit. All very good up until this point. Then things took a turn for the worse. Enter Garment Printing’s Gavin Drake (@garmentprinting on Twitter). I just noticed from the visual this is a crew neck. I’m sure I ordered a polo! Is it too late to change? Now that I’m back at my PC I have checked all of the emails including the quote and cannot see any mention of T shirt versus Polo. Am I missing something? Can you collect from there. Ah I see. Very subtle! Not exactly “I stated that we only has the ability to do tshirts in the quote and in the emails” is it? May I suggest next time you spell it out with a bit more clarity rather than seeking to blame your customers for missing the info. Anyway, thanks for getting this done so quickly. A t shirt to most people is a generic term that could include a crew neck, V neck, polo whatever. I’m not really interested in whether you think your communication was clear – the fact that as a customer I am saying it was not clear should be all you need to concern yourself with so you can avoid future misunderstandings. Anyway, your attitude alone is such that I will not be using your services again. Shame because I am genuinely happy with everything else you guys have done for me today. Yes actually. Got to Mark’s and the T shirt was not ready. Have to go back in half an hour. Still, no doubt that does not warrant an apology either. By the time I got back from my second visit to Garment Printing’s local agent I guess Gavin had gone home for the weekend as the communication ceased. “are you having a bad day?” – can you believe that?